QR Codes are well know graphical information carriers. QR Codes themselves do not have to be standard black and white pattern. Qr Codes can be enhanced with graphics and color. Based on the possibilities with the QR Code's error correction in combination with unused space, a custom QR Code, where a picture, for example a logo, is an integrated part of then the QR Code's graphics. This QR Code example is both a part of the site's logo, as well as a link to the site. Since the picture itself in an integrated part of the QR Code, and therefore also a part of the error correction possibilities, Custom QR Codes can handle bigger graphics in comparison just overlying a picture and let the error-correction handle the mismatch. 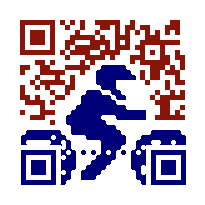 QR Codes can contain colors as can be seen in the example. Code scanners will convert the picture to a black and white. light colors will result in white, more dark colors will result in black. In order to help the reader, only colors with high contrast should be used. Lowering the light/dark contrast could result in unreadable codes. If you require a custom QR Code, don’t hesitate to contact me to see what the possibilities are.